stressed that the "Year of Renewal,"
Jewish people throughout the world. show we care, for if we don't, who will! " ing Libowsky, Steve Lewin, Samuel K.
paign has known no bounds. needed to achieve those aims. for the exciting President's Mission departing September 15. President'8 Mission co-chair; and Lee Ranch. Oshry, Kenneth Bierman and Steven Lewin. transport aboard an Israel cargo plane at Rimon Air Force Base. Israel, March 25-April 5, 1987.
visited Israel at least once. Yad Vashem and much more. the Federation office, 8358 W.
Martin at the Federation, 7U8-H00. satisfying things you have done. Please coil either Bonnie L.
in the issue of Friday October 24.
which does not endorse any political candidates. on pooWde Totally redecorated and beautifully reftatolshedoTj^irjorn. what claims have to be filed. Reibel, Lillian Davis, Belle Wiener and Ruth Horowitz. Sister City. Kfar Saba, Israel. which has proved too costly. side events, some by members of the government. outlined policy since the fall of 1984 remain in force. power between Jordan and the PLO in the territories." peace while Foreign Minister, even if some in Likud object. Unlike Peres, who has sought to make the "Jordan option"
prove relations with Japan," the analyst said. ty and no decision can be taken without the other side." POSTMASTER: Send address changes to The Jewish Flortdian. their first meetings with Congressmen on Capitol Hill. the United States does not recognize the PLO. The Senate recently adopted a measure introduced by Sen.
ducted an on-site evaluation of the PIO's activities. weight" of U.S. resources and international law. "any and all (PIO office) activities are legal." terror is not farfetched ... We should not take that chance." Jewish terrorist underground still in prison. return in the near future, the Absorption Ministry reported. ment of the Arab-Israel conflict." fifty cents in taxes for each dollar you donate. your gift will be credited to your fund. distributions to charities of your choice. Babbs and his former wife. Jews," Rabin said in a speech to the Heritage Foundation. included and in which peace is discussed,'' he said. delicious taste of Maxwell House-Coffee. It couldn't be anything but Shabbos dinner. Women m Hold // Key. an example of courage" (N.Y.
70s was the "hopeful time." country and break Israel's back. age division in the Soviet Union. Semitic threats directed at them. 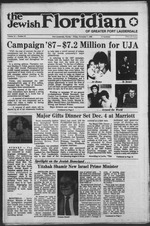 ed to five years of exile in 1984.
interest to the Jewish community. November 11 at the Country Club. Ben Kaplan and Sam Lezell. day of the month at Beth Am. associate in charge, Paul Levine. mittee Meeting. 9:30 a.m. At Federation. Nov. If Homes of Inverrary Breakfast. Nov. 17 Women's Division. 7:30 p.m. P.M.
Century Village be so successful. will be displayed in the clubhouse. citing because it was our first,"
K. Miller, Sidney Goldstein and Tobey Shabel. idea at the Jan. 5 breakfast." amounts of $100 through $999. held on Thursday, December 18.
a wealth of dedicated people,"
the Mayfair House in Coconut Grove on Sunday, Dec. 14.
man, Bernie and Susan Canarick and Alan and Elaine Conn.
Jackowitz at the Federation, 748-8400.
always, the summer has passed. camp being put on back burner. want their lives to be enriched. which we judge before and after? Caravan who visited with us. ed and very secure and happy." tion of the Quad Cities. Temple Beth Torah in Tamarac. Civil Religion of American Jews." begin promptly at 8 p.m.
call Helen Weisberg at 748-8400.
reconciliation with the Nazi past. rorism" (Voice of Lebanon, Sept.
state. He derived his strength from imagination." memorated by changing his surname to Ben-Gurion. Munweias, with whom he would have three children. the de facto Jewish government in Palestine. invading armies of five Arab countries. on December 3, 1973 at the age of 87.
responsible for the establishment of the State of Israel. ed Negev desert bears one brief epitaph: "alah ana 1906"
cant event of his life. other program materials available to the general public. Gurion in its November issue. dent Muriel Lunden left for Israel. which are all supported by WLI. forth to give his/her testimony. call the center at 940-5690.
meeting, 10 a.m. At Temple. Jewish Community Center, 1 p.m.
Breakfast, 10 a.m. At Temple. ship luncheon at Nob Hill Rec. St., Coral Springs. 7:45 p.m.
Coconut Creek Chapter, 12 noon. 6191 Rock Island Road, Ft.
12 noon. At Holiday Inn, 5100 N.
State Road 7, Ft. Lauderdale. Sunrise Lakes Drive N., Sunrise. A scene from the Coral Springs Chanukah Festival of 1985. Israeli art and artifacts exhibit. will perform from 2-5 p.m.
which will begin at 5 p.m.
at Temple Beth Israel, Sunrise. since its founding in 1986. 4- Who is Molly Picon? solicite funds for the poor? 8- What is meant by Gematria? Jewish exiles in Babylonia gather? ting of the Prayer book? 4- A noted Jewish Comedienne. Hebrew letters of the alphabet. To make life less humdrum. Indeed makes us feel blessed. and my child upon my knee. And when do I sing my song. Will I be entirely free. And helped overcome their strife. It's our turn to receive! But it's difficult to breathe! can help you to meet your needs. and in Deerfield call 427-8608. Clifford 8. Golden, LCSW Ed.D. day 8:46 ajn. latM Eat P. Stea*. TEMPLE BETH ISRAEL (742-4040), 7100 W. Oakland Park Blvd., Sunrise, 88813. Saturday 8:46 am, 7:46 p.m. RaaM Heward A. Addisea. Caster Maarice A. Nea. Blvd.. Deerfield Beach. SS441. Services: Sunday through Friday 8:30 am., 6 p.m.
Jesoah I afar. Caster Shaktal Ackenaaa. TEMPLE B'NAI MOSHE (942-6880), 1484 SE 8rd St, Pompano Beach, 38060. Services: Friday 8 p.m. Caater Jeaadah HeUbraaa. TEMPLE SHA'ARAY TZEDEK 741-0296), 4099 Pine Island Rd., Sunrise, 33821.
day 8:46 a.m., 6 p.m BabM Readall Ksslgskarg. Caater Jack Marcaaat. 8:46 am. BabM Israel Hataara. I 6486 W. Caammtml Blvd., Tamarac, FL 38819.
p.m., Saturday at 8:46 am. TEMPLE OREL B'NAI RAPHAEL (788-7684), 4861 W. Oakland Park Blvd..
t a-m., 6 bum,, Saturday 8:46 am., 6 p.m.
6:80 p.m. Study grease: Mea. TOTJNB ISRAEL OP DEERFIELD BEACH (421-1867), 186t> W. ffilamoro Blvd..
Deerfield Beach, 88441. Sarvieee: Sunday through Friday 8 am. and sundown. Saturday 8:46 am. and sundown. Jeeesh M "
vieee: Friday 8 p.m.; Saturday 10 am. BaeM Mark W. Gross. Menorah Chapela, 2806 W. Hillaboro Blvd.. Deerfield Beach, 88441, Friday 8 p.m.
RaaM Nathaa B. Fish. Caater Morris Levkesea. Bat Mtavah. RaaM Jeffrey BaBes. Caaaar Rita Share. Continued from Page 1 Federation in the country. le rank of the 23rd largest proud of!" daughter of Mrs. Marilyn Kirsch. r. mi NW 67 St.
man, spiritual leader of Bat Yam. Cooper family, in memory of Mr.
Nov. 9 honoring Benjamin K.
Nov. 23 honoring Col. Henry L.
Luncheon tickets will be $5. If you've shopped for funeral pre-arranoemenls. "Help Strengthen A Secure and Vita i Our Own Commur il Future for Jewish lity and Establish Life Worldwide."